MacVector is extremely customizable. If you don’t like the defaults we supply, its very easy to change them. 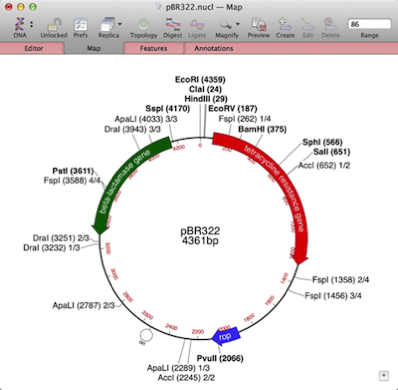 Lets look at restriction enzyme sites. By default we show unique sites in small red letters and sites that cut more than once in small blue letters. But suppose you want something bigger, bolder and, well, more black and white? Here’s how to do it. Hold down the [option] key and choose the Options | Default Symbols menu item. If no sequence windows are open, you don’t even need to hold down the ∫ key. 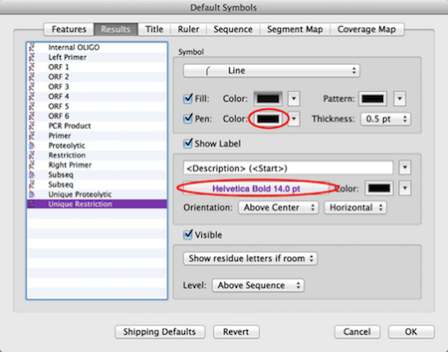 This opens the Default Symbols editor. In the Results tab, select the Unique Restriction item and change the font e.g. to Helvetica Bold 14.0 pt. Then click on the Restriction item and maybe change that to Helvetica 14.0 pt. I’ve also changed the Symbol pen color to black. Click OK to dismiss the dialog and save the changes, then open up one of your favorite vectors (you do have to re-load sequences for the changes to take effect). This entry was posted in Tips and tagged cloning, graphics, restriction digests, weeklytip. Bookmark the permalink. Both comments and trackbacks are currently closed. Thanks for the info on changing the default symbols. Is there anyway to change the defaults in map view? I am using macvector to look at genomic regions and find the defaults for CDS and mRNA are not suitable for my purposes. I prefer segmented blocks or arrows rather than the default unsegmented arrows. I am able to change the settings for each map to get it to look as I would prefer, but can not find a way to save those settings for all future maps. Is this possible? If not, it would be great if you could add that feature to your next release. Thanks. All aspects of graphics are customisable in MacVector. Hold down the OPTION key then go to OPTIONS > DEFAULT SYMBOLS. That will change the defaults for all symbols. However, the default symbol for CDS (not mRNA though) is already a segmented arrow. It may be that you have some much older symbols stored as your defaults. Try hitting the SHIPPING DEFAULTS button to reset the symbols. Alternatively you can completely reset your preferences.